1. Try cookie cutting rotis into different shapes. The different shapes will keep them interested and it will be a fun teaching exercise for your kids as well. 2. Add jam or preserve to your regular roti in case your kid doesn't want to pair it with regular vegetable. The sweetness will make them want to eat more. 3. Offer up a dessert version! 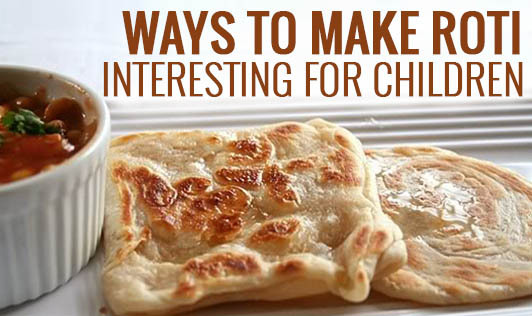 Caramalized roti crisps are sure to get your children hooked onto rotis. The crisps use 4 simple ingredients (ghee, sugar/honey, cardomom, and old rotis of course) and take all of 10 minutes to make. 4. Wrap it up! Offer roti rolls/wraps with a variety of fillings and a nice dipping sauce. 5. Stir frying rotis along with other steamed veggies will make the dish more interesting to your kids. Plus, it also makes for a nice one-pot (skillet rather) meal!